Your feelings towards III will pretty much depend on how you feel about your music being polished down to a glistening sheen of chrome. 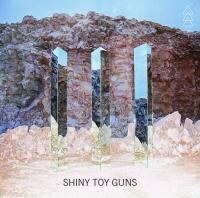 The album III marks a return of sorts for Los Angeles group Shiny Toy Guns. For one, it heralds the return of vocalist Carah Faye Charnow, who left the band after the 2006 release of their debut We Are Pilots, an album that was actually re-recorded and re-released three times on various record labels. The album also is suitably retro – a return to the keyboard-heavy New Wave sounds of the early ‘80s, which is probably par for the course for a group that recorded a version of the Peter Schilling hit “Major Tom (Coming Home)” for a car commercial. Listening to III, which is, wait for it, the band’s third LP, is a bit of an invigorating experience. It is equal bits M83, Blondie, No Doubt and, particularly, Metric. (You get the sense from listening to this album that Emily Haines wants her vocal mannerisms back.) It’s exactly the sort of club-friendly dance synth pop that is the product of a band that was actually nominated for a Grammy Award for Best Electronic/Dance Album with We Are Pilots. And it is certainly radio friendly, almost to a fault, thanks to the presence of mixer Tony Maserati, who has worked with Lady Gaga, Beyoncé and Jason Mraz. You listen to the bouncy “Speaking Japanese” and can imagine it to be a big radio hit. Which means that III is a bit similar to just about anything and everything that’s out there in Top 40 land, which is both damning and laudable. So, to put it this way, your feelings towards III will pretty much depend on how you feel about your music being polished down to a glistening sheen of chrome. A lot of the songs do sound alike, but there’s certainly variance to be had too. “E V A Y” even utilizes the same anthemic background voices of Arcade Fire’s “Wake Up”, and the opening vocals by Chad Petree sound slurred as though they were played backwards. Meanwhile, “Fading Listening” has a Californian Fleetwood Mac vibe to it, making it a sort of upbeat, ‘80s keyboard version of “Dreams”. Along with “Speaking Japanese”, it is clearly an album highlight. And, with final track “Take Me Back to Where I Was”, the band takes away the pumping synth lines and replaces them with a piano. In fact, it comes across as sounding a little Jackson Browne, which is odd considering that this is largely a dance pop record. Still, it’s a strong track, a worthwhile contender and, in its position as the final song, might be pointing the way for a new direction for Shiny Toy Guns. It does, however, stop the record dead cold, and takes something away from the ebb and flow of the album. It’s particularly jarring if you reloop III and start it over from the very beginning, which makes it seem like a bit of an afterthought. Too bad, as it is actually a very pretty song – but maybe it just doesn’t belong here. Overall, III is not horrible: it has its share of high points, and some songs that sound interchangeable, which may make them seem to be little more than filler. However, by and large, III is an album you can dance to. And if you’re a fan of the bands listed at the start of this review, you may find quite a bit to admire about Shiny Toy Guns. They’re at their best when they turn down their obvious ‘80s influences, and get a little deeper on songs such as “Fading Listening” and “Take Me Back to Where I Was” (which, come to think of it, might be an entreaty to fans to give the group a second chance with the re-emergence of Charnow). It turns out that III is mildly enjoyable on its own terms. It’s something that doesn’t exactly revolutionize the dance pop genre, but you might find the female-male vocals to be an interesting new wrinkle. And, certainly, despite its faults, III is a lot more interesting that a lot of current hits that are being played on the radio. So, if you like listening to anthemic dance pop, III might hit the spot. It’s certainly good that the original line-up has settled whatever differences they might have had, and have reunited to attempt to reach the brass ring that they clearly covet. There are certainly worse albums to be had than III, which might sound like faint praise, but there’s not a lot here that’s new and startling. Which might be the way you and the band might like it. With III, Shiny Toy Guns basically prove that marinating in the sounds of the ‘80s is something they clearly aspire to. It’s just that they’re more interesting when they reach a little higher and beyond that.